Sunday marks the 150th anniversary of the “Great San Francisco Earthquake” — but not the one you’re thinking of. 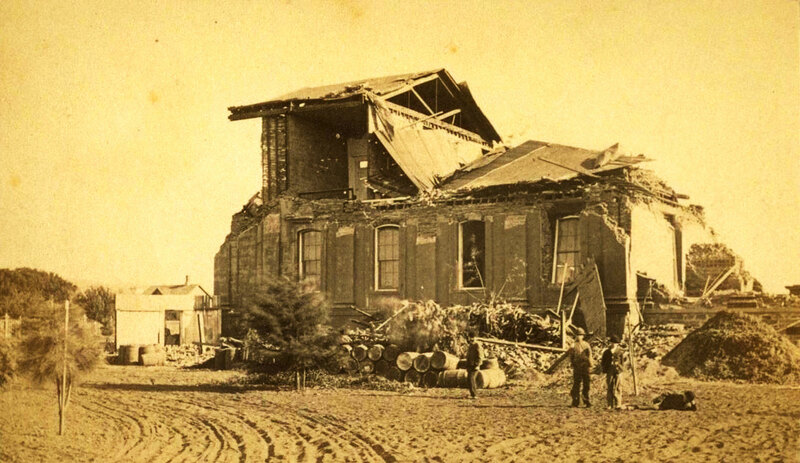 On Oct. 21, 1868, a major quake struck on the East Bay's Hayward Fault. The jolt reached across the Bay and caused extensive damage in San Francisco, the region's largest city, so the name stuck. When a bigger one came along on the San Andreas Fault in the spring of 1906, the Great-Quake moniker was reassigned. But things have changed since 1906 and the Hayward is now considered the most urbanized fault in the nation. It runs for 40 miles through the East Bay's most densely populated areas, not to mention key infrastructure such as airports, freeways, rail lines, and a major port. Scientists say it's also the most likely source for the Bay Area's next “great quake." "The Hayward Fault is ready now," says UC Berkeley seismologist Roland Burgmann. "It has built up all the energy it needs for a future event, so it could happen today, but it could also still wait another couple decades and then just have a somewhat larger event, because it took longer." Scientists have calculated about a 30 percent chance that the Hayward will “break big” -- with a M6.7 event or bigger -- within 30 years. The recent "HayWired" scenario from the U.S. Geological Survey projects that in the aftermath of a magnitude 7.0 quake on the Hayward, 2,500 people would need immediate rescue. Serious questions remain about whether emergency responders could get to everyone's aid, given that roads are likely to be blocked and water for fighting fires cut off in many areas -- possibly for weeks or months. "In terms of exposure of hospitals, schools, lifelines, it's really unequaled," says Burgmann. So, scientists have been trying to handicap where the fault is most likely to slip again, by mapping portions of the fault that are constantly slipping in slow-motion, or "creeping," and portions that are "locked." Those locked portions hold the biggest quake potential because when they finally break loose, far more energy is released. "If we know where the fault is locked versus creeping," explains Burgmann, "we can much better say which areas, which neighborhoods are more strongly affected"
Scientists haven't pinned down exactly the epicenter of the 1868 quake, but are convinced that it broke on the southern segment of the Hayward Fault, which runs from Oakland, south through Fremont. The next major temblor, they conclude, is likely to be in about the same place. The USGS calculates that as much as $80 billion has gone into earthquake preparedness in the nearly three decades since the Loma Prieta quake, a M6.8 shaker that caused widespread damage throughout the Bay Area. More than half of that has gone toward shoring up transportation infrastructure and health care facilities, according to the report. Another quarter was for upgrading privately owned buildings and schools, and the rest was "to strengthen the Bay Area’s water supply, government and emergency response buildings, electric and gas lines, cultural facilities, sewer lines, data centers and non-profit buildings." But achieving "resilience," to use the current buzzword, is a project with no end in sight. "It really takes building codes, planning by all the different agencies and communities involved to be more and more ready," says Burgmann. "We'll never be really ready."